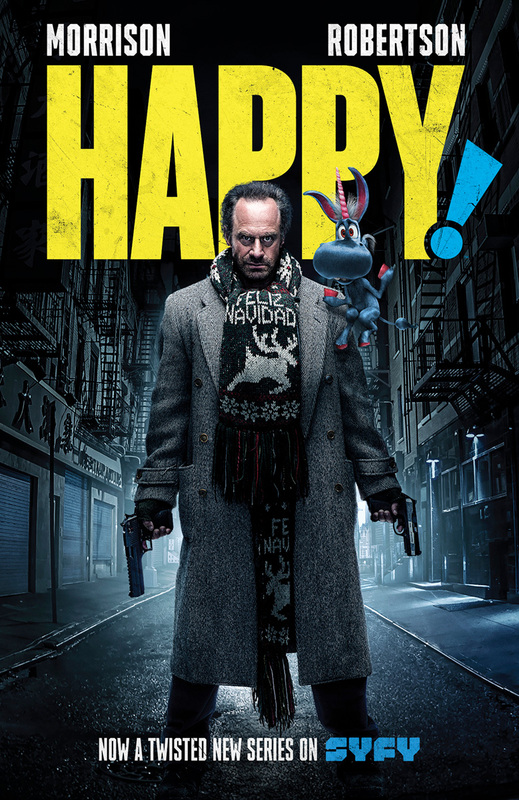 This week sees the eagerly-anticipated television debut of Happy!, an adaptation of Grant Morrison and Darick Robertson’s critically acclaimed Image Comics series. So, before the show airs on SyFy, and in the spirit of the Christmas season (because this is, for all intents and purposes, a Christmas story), we’ve decided to take a look back at the graphic novel itself. The basic premise is fairly straightforward. Nick Sax, an alcoholic former-detective-turned-hitman, starts seeing a little girl’s imaginary friend – a flying blue horse – following a near-death experience, and is told that the girl is in danger and that he’s the only one who can save her. This is perhaps Grant Morrison at his most accessible, interestingly enough, substituting his trademark eloquent existential prose and dialogue with a barrage of F and C-bombs. It’s also one of the more simplistic stories Morrison has ever produced, not counting the clash of styles (ultra-violent hitman meets flying cartoon horse) that the series hinges on. Right from the opening pages, it’s clear that Morrison and Robertson are revelling in seeing just how far they can push the envelope, unfettered from the type of editorial restraints frequently present in comics at that time. At times however, it feels like the pair are perhaps going a little too out of their way to prove how wild and unrestrained they can be, occasionally at the expense of the story itself. Several scenes are inserted without any real reason or purpose (one involving a man in a giant insect costume immediately springs to mind) other than to be shocking and depraved, and while the ultimate intent of these scenes – to showcase just how fucked up the world really is – is valuable, the execution comes across as a little tawdry and cheap. That said, Robertson is the real champ here, providing some of his most vivid, visceral work of his career during the course of Nick Sax’s story. The violence is in-your-face and unrelenting, the character design is top-notch (“Santa Claus” in particular will stay with you long after you’ve put the book down), and the wonderful contrast between the smiling, Loony Toons-esque Happy and the violent, disturbing world around him is executed to perfection. Oh, and there’s one particular double-page spread near the end of the story that will have you grinning from ear-to-ear and lingering on it to pick out all of the glorious details Roberson has included. Other minor niggles aside, the ending is perhaps my main issue with the whole thing, with a confusingly convenient and faintly underwhelming resolution that feels a bit like Morrison simply ran out of shocking stuff to do and say. The sentiment being delivered is admirable, and the final pages are powerful, with the ‘blue feather’ motif being executed to near-perfection, but the way the ‘big bad’ is finally brought down is, to me, almost insultingly lazy. Ultimately though, the story holds together fairly well, and in spite of the gratuitous violence and relentless profanity, it actually ends up being pretty damn close to an actual, honest-to-goodness Christmas tale. It’s a bit like A Christmas Carol, if Ebenezer Scrooge was an ultra-violent, F-bomb dropping, eczema-plagued alcoholic hitman, and the ghosts of Christmas past, present and future were combined into a relentlessly upbeat flying blue cartoon horse. Okay, so it’s nothing like A Christmas Carol, but it’s still a visceral, darkly comic and ultimately uplifting read nonetheless. Happy! debuts on SyFy on Wednesday 6th December, and you can pick up the newly-released Deluxe Edition of the Trade Paperback in all good comic shops now.